This is to say that the Orthodox Church has remained true to the faith that was handed on to us by Christ. The term itself evolved in a historical situation in which it was necessary to distinguish the true, apostolic tradition of the Church from false teachings. This tradition has lived on up to the present day, continually transmitted and sustained through the holy sacraments. One becomes a member of the Orthodox Church by Holy Baptism in the name of the Father, the Son and the Holy Spirit. This is followed by Holy Chrismation, during which all the person’s sense organs are sanctified by the seal of the Holy Spirit. Baptism and Chrismation culminate in the Holy Eucharist, communion in the Body and Blood of Christ. The passing-on of apostolic authority takes place in the Church through the holy sacrament of Ordination. The shared life of husband and wife is blessed through the holy sacrament of Marriage, in which, with the crowning of the bride and groom, the two become one in Christ. For the healing of the human person’s anxieties and spiritual wounds, the Church has Confession, also called the sacrament of repentance. Sacramental life is underpinned by regular prayer and by fasting – the abstention at certain times from meat and dairy products; more generally, the avoidance of everything that inhibits communion with God and others. At least once a year, before Easter, the Church carries out the holy sacrament of Unction. The sacrament of Unction is not, for Orthodox people, “last anointing.” Rather, it is for healing and the forgiveness of a person’s sins. The sacrament of holy Unction may be also carried out whenever a member of the Church is very ill; the result is complete harmony with God, which neutralizes illness and poor health. Anyone may enter an Orthodox house of worship to light a candle and to pray for oneself, one’s loved ones and the departed. The priest can also be asked to pray for someone, to say a special prayer service for the departed or to perform a funeral. The Divine Liturgy – participation in the Holy Eucharist – lies at the heart of the Church’s life. The congregation gathers on Sundays at ten a.m. to offer together a “sacrifice of praise,” to take part in the Body and Blood of Christ and through this to receive spiritual nourishment. 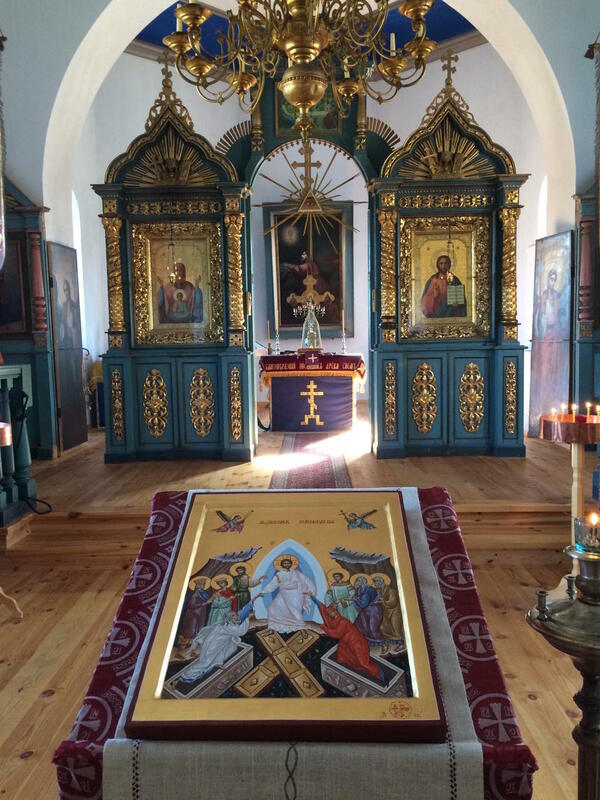 There are around 70 Orthodox people on Hiiumaa, half of whom participate more actively in the Church’s life of prayer.